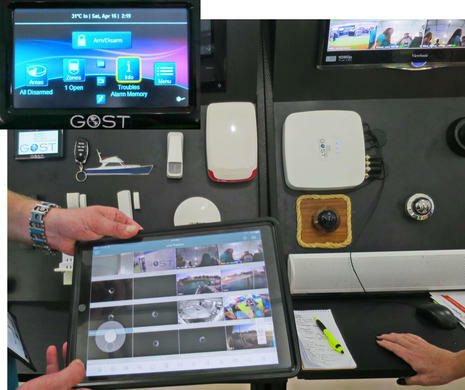 GOST Nav-Tracker 1.0 helps owner recover stolen boat in the Bahamas. Global Ocean Security Technologies, or GOST, recently announced the recovery of a stolen boat in the Bahamas thanks to its Nav-Tracker 1.0 tracking system. According to the company, a Bahamas homeowner contacted police in Marsh Harbour to report his 34-foot Jupiter center console missing in June. The owner then accessed his GOST system via a secure web account, and the system pinpointed the boat’s location, tracked its course and sent position reports to the police every five minutes. The boat was recovered within three hours of the owner realizing that it had gone missing. Three of the thieves were still aboard; all were charged by Marsh Harbour police. A fourth suspect was arrested later. “We hope that the growing use of GOST’s tracking and security systems not only increases the number of boat recoveries, but more importantly reduces the number of theft attempts, which are giving a lot of bad press to the good people of Abacos,” said Brian Kane, GOST’s director of research and development. Global Ocean Security Technologies, more commonly known as GOST, says its Nav-Tracker 1.0 helped recover a stolen Yellowfin from Tarpin Cove Marina. The boat was docked at its berth in Naples, Fla., on the evening of May 16, when it was stolen, triggering a geofence breach. The white Yellowfin with triple 300-hp Yamaha outboards was brought out to Sanibel, Fla., at low speeds, and then proceeded north off Gasparilla Island. Based on updates sent by the GOST Nav-Tracker, the boat picked up speed five hours later and began running southwest toward Mexico. The Coast Guard was notified and was provided with location, speed and heading updates every two minutes from the GOST Nav-Tracker while giving chase. The vessel was recovered without incident, and a suspect was taken into custody roughly 85 miles due west of Naples. Global Ocean Security Technologies (GOST) has been in the boat monitoring business since before they were GOST, and just last week their venerable Nav-Tracker 1.0 was key to the recovery of a stolen Yellowfin well on its way to Mexico (hi res tracking here). Jay Keenan, President/CEO of Global Ocean Security Technologies (GOST), has been identifying and filling market needs since middle school when he sold candy to classmates in his rural community who didn't have a store near them. After an early sales career and MBA, Keenan joined GOST in its very early days. "When I came to Florida, I met the GOST founder, who had just moved the company out of his garage," Keenan said. "I came in as an inside sales rep with no pay, a desk, a phone and an internet connection without a computer to connect to it. It was a 100 percent commission based structure. I saw the market need so within the first six months, I bought out one of the partners with my savings, and over time have bought out all of them except the CTO." GOST specializes in security, monitoring, tracking, surveillance, acoustic deterrent, and cloaking systems for all types of maritime vessels. "Our differentiator is the quality of the product and the support behind it. We're definitely known as offering the best of the best of what's available," Keenan explained. "Our tech support for dealers and end users is unmatched. We have more tech support staff than any other position in the company. Our customers can always call and speak to a live person to get their issues resolved the first time they call." Keenan's advice to aspiring entrepreneurs is about persistence and goals. "Number one is that persistence and determination are everything," he said. "It's just a matter of keeping focus on your goals and not giving up. Work harder than everyone else is willing to work. Its important that you believe in why you're doing it because if you just start a business to start a business and you're not passionate, then you won't enjoy the process which is important." 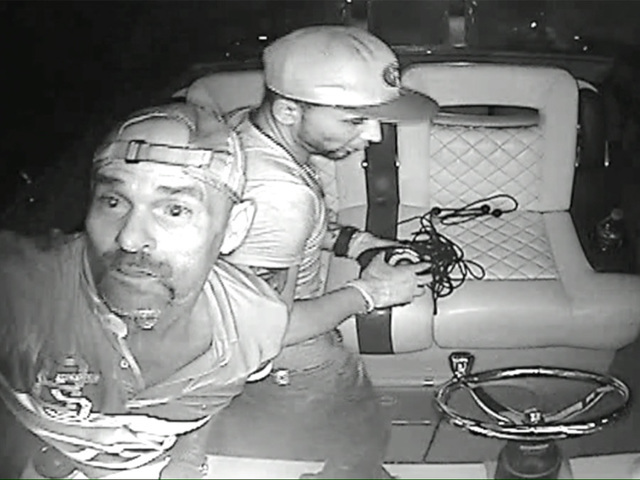 Surveillance video shows possible boat thieves at a Delray Beach business. Security cameras caught them attempting to steal a boat early Friday morning. They failed. They came back early Saturday morning and surveillance cameras were able to capture a clear image of their faces. "Just livid. Can't believe it," says John Kujawa. John had his 37-foot boat parked at his business, Lumitec, in Delray Beach. Surveillance footage shows three men arriving, with two of them climbing on board, hitching it to their truck and taking off with it. Kujawa says the boat is important to him, "Sort of a labor of love between me and a lot of my lead engineers." He hopes with the security footage, he can get his boat back soon. "We're thinking someone out there must have seen something," Kujawa says. DELRAY BEACH (CBS12) — A Delray Beach business owner is thanking social media watchdogs after his post led to the quick recovery of a stolen boat. Now the search is on for two brazen thieves responsible that were captured on surveillance video cutting the wires to the GOST security camera installed on Lumitec's intrepid 375. Little did they know that sent an alert to owner John Kujawa. "I immediately knew we had a problem. I was sickened by it. I pulled up the cameras to see the people taking the boat," said Kujawa. Kujawa tracked the 37 foot boat all the way to Florida City before the gps system cut off. Camera footage also captured the white Ford dually and car carrier the thieves used to case the business days before. Images Kujawa and his team posted to social media never imaging how quickly they would spread. "The response to that was amazing," said Kujawa. "People started to push it it to their friends and their special interest groups and it really snow balled from there." By Sunday and more than 60 thousand shares and views later there was a break in the case. A member of the Hull Truth, a boating forum happened to see the boat stashed behind a motel near Miami and posted this image with the words, "I found ur boat"
"I called him and I said is there anyway you can stick around there and he said, "Yes, I am a fisherman a boater. I have followed the story," said Kujawa. "He stood watch"
In the recovery process they stumbled into the white Ford 350 Dually and the car carrier trailer captured on Lumitec's factory video surveillance, which also happened to be stolen. That owner was also ruined to his belongings thanks to social media. "When something like this happens you feel violated," said Kujawa, "It kind of erodes your faith in humanity a little it. I have to tell you the outpouring was just the opposite." The search for the suspects and Kujawa's 2005 black Ford 250 continues. Vessel monitoring and tracking systems can deter onboard break-ins, let you keep control of devices, and help recover stolen assets. You can protect your boat with more than a locked gate. The ruse worked, the thieves scattered, and Slocum and Spray continued sailing. While this tale of preparation trumping thievery has a humorous outcome, it hits on several key factors that still hold true in 2017. A good security system employs careful planning, superior technology, and subterfuge to induce fear and confusion among any unwanted visitors. Moreover, like Slocum’s tacks, a proper security system gives those on board the tools and time to react to any threat. Sailboats, after all, are high-dollar investments and will always be tempting targets for thieves. To protect them, modern security and vessel-monitoring systems use stealthy sensors, ­cellular modems and geofences, among other surprises, to thwart intruders, while also allowing an owner to monitor and control different onboard systems and devices from afar. Here’s a look at how this ­technology works and how it can make your vessel safer from theft and systems-related trouble while delivering peace of mind. The best vessel alarms are those that are hard to detect and involve multiple stages of escalation. “Security is like an onion,” says Jay Keenan, president and CEO of Global Ocean Security Technologies, or GOST. “The more layers there are, and the more independent each layer is, the more secure the asset becomes.” Because of this, contemporary security systems use combinations of obvious and hidden devices such as deck-pressure sensors, infrared beams, door and hatch sensors, motion detectors, and IP-enabled ­cameras, as well as lights and sirens, all of which can be monitored and controlled from a smartphone, tablet or computer. These sensors and detectors report to a central-­processing unit, or CPU, which is typically a black box that’s equipped with a cellular modem or a Wi-Fi card, giving it the ability to communicate with the outside world. Most security and vessel-­monitoring systems are designed to be expandable, allowing owners to add ­sensors and vessel-­specific solutions as needed. Most modern security and vessel-monitoring systems, in fact, can be configured to contact an owner, marina, harbormaster or police in the case of unwanted activity by sending an email or text message, or even make a phone call. If this sounds like a home-security system, you’re on the right track — but with a key difference. Should an alarm trip, most vessel-­security systems do not contact a monitoring center, where a worker calls the owner and the police. Instead, these systems execute a call themselves based on a set of rules and parameters that are either bundled into their operating systems or determined by their owners. Like many of the systems available, Aqualarm relies on a simple control panel and uses a cellular modem (left) to transmit data to a tablet or smartphone. Its devices include things like sensors for bilge-water level (center) and engine temperature (right). While most criminals are quickly scattered by the sound of an alarm, the obstinate few press forward, perhaps thinking that they can defeat the system or that time is on their side, especially if valuables and electronics can be easily snatched. Should that happen, robust systems can create highly unpleasant working ­conditions for the thief. “We make acoustic devices that, at a close range, create an unbearable frequency pattern,” says Keenan. “It’s not loud, but the intruder will experience vertigo.” Should the intruder break into the saloon, for example, devices such as GOST’s Cloak emit a vaporized glycol solution that fills the cabin with a thick, disorienting fog that makes it almost impossible for a thief to see or, sometimes, even escape. Critically, yacht-security systems should be able to be deactivated only by the owner and never by a ­burglar. This is accomplished by using app- and website-­based user interfaces to control the system, as well as ­hidden ­hardware and reserve batteries, should a mainline power ­supply or the system’s CPU get compromised. While vessel-security systems have historically represented the bulk of the remote-monitoring market, this is changing, says Keith Cariani, director of business development at Aydin Marine (née KEP). The vast majority of inquiries that Aydin gets these days are from customers interested in vessel monitoring. In addition to Aydin’s Seatether, players in the monitoring arena include companies like Yacht Protector, Siren Marine’s Pixie, Scribble Software’s MyBoatStatus and Aqualarm’s various sensors. These companies still offer vessel-security elements such as geofencing, door sensors and pressure mats, but their systems are more oriented toward monitoring metrics such as bilge-water levels, the frequency that the bilge pumps are running, batteries and shore-power supply, as well as fire, smoke, temperature and humidity levels. Like security alarms, most vessel-monitoring systems consist of a CPU and a network of wired or wireless sensors that can be set to monitor and control a bevy of onboard devices, ­ranging from masthead lights to bilge pumps. This is typically accomplished using relay switches that can power devices and systems on or off, and which are controlled via the CPU and apps that run on a smartphone or tablet. Other systems, such as YachtBrain — which was launched at the 2016 U.S. Sailboat Show in Annapolis, Maryland, and which is expected to be available in 2017 — focus on vessel monitoring, control and automation. According to Allen Beckerdite, YachtBrain’s co-founder, the system uses wireless sensors and relays that are programmed to owner-­defined rules and alerts, and take action when conditions warrant. The system might, for instance, blare an onboard horn if the high-­water alarm is triggered or send an owner an alert. Today’s remote monitoring systems let boat owners keep tabs on everything from engine temperature and bilge-water levels to the physical location of the vessel and its many systems, such as video cameras and even lights. YachtBrain lets you adjust devices via your cellphone. YachtBrain’s basic ­system can sense up to four electrical devices, and users can define alerts for events such as a bilge pump cycling three times in 10 seconds or, conversely, to report a pump that has not run in 30 days, which could mean it needs maintenance, says Beckerdite. YachtBrain is expandable by simply adding more sensors and relays. Unlike most other vessel-­monitoring systems, YachtBrain doesn’t simply send an email or text message to notify owners about status updates or alarms. “YachtBrain uses a ­reliable connection protocol that is designed to operate over unreliable network connections,” says Beckerdite. “These protocols were designed for industrial use and are now being used for the Internet of Things.” For remote access, most ­systems rely on a built-in ­cellular modem, a Wi-Fi card or satellite capability. Controls are via an app or secure Web page, allowing owners to log in to the networked systems from anywhere, provided that the vessel can communicate with the Internet. YachtBrain, says Beckerdite, takes things a step further. In addition to its built-in Wi-Fi card, if no Internet connection is available, the system’s CPU can make decisions on its own, based on rules the owner has established, and then report the actions taken once connectivity is restored. Provided that ­connectivity exists, modern vessel-­monitoring systems ­provide peace of mind, especially when owners are away from their boats. Here, however, systems need to strike the right balance of keeping an owner informed without generating and sending large, expensive amounts of data. “The data bursts are really small, and our sensors run off internal batteries,” says Vance Young, the director of technology at Scribble Software. “Our entire system uses less than a megabyte of data all month.” Young notes that constant sensing (i.e., motion sensors) uses more data than ones that report on longer-interval schedules (i.e., high-water sensors), so an owner can tailor data usage to acceptable comfort levels through a choice of hardware. Finally, most vessel-security and -monitoring systems are also designed to help recover a boat in the event it’s been stolen. Fortunately for sailors, thieves tend to be more interested in powerboats, but sailboats do disappear, and unlike powerboats, are capable of operating for prolonged periods without refueling. Because of this, products such as GOST’s Phantom Insight or Nav-Tracker use hidden tracking antennas with self-contained, two-way Inmarsat satellite modems and GPS receivers that notify their owners or other owner-­designated parties if the alarm trips or if the vessel breaches its owner-­defined geofence. These systems continually send their position information to a secure server, allowing the vessel to be tracked in real-time, even if the thieves destroy the CPU or start indiscriminately ripping wires from the panel. While yacht-security and vessel-monitoring systems can be expensive — they can range from a few hundred to several thousands of dollars — and require proper planning, technology and connectivity, they are a wise investment for anyone who keeps their boat in a high-crime area or doesn’t live close enough to regularly check on its status and systems. Provided that the proper level of technology is applied in tandem with the right amount of subterfuge and surprise, these systems provide a ton of security and reassurance, without requiring you to scatter carpet tacks on deck before finding your bunk. David Schmidt is Cruising World’s electronics editor.